The Lumintrail Rear Frame Mounted Cargo Rack for Disc Brakes is the perfect solution for transporting heavier top and side loads up to 55 lbs. It can easily accommodate any brand or style bike (with disc brakes). 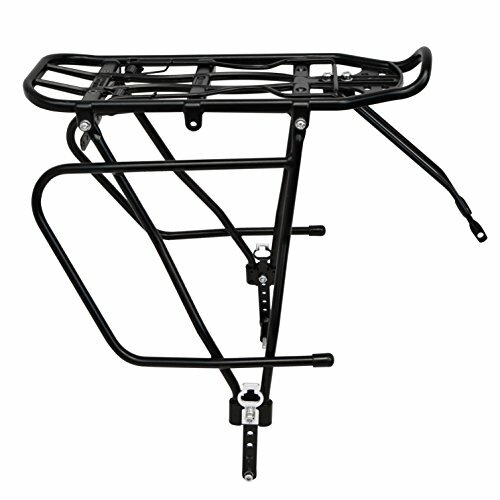 Made of durable anodized aluminum, the rack is designed to withstand outdoor conditions and will keep your items safely fixed without bothering you while you ride. Perfect for touring, commuting or just rides around town. Adjustable Height, supports adjust from measure 13.25 - 15.5 inches, for bikes 24" to 29"
WARNING: Weight Limit is 55 lbs. Not intended to hold a person! NOTE: Not suitable for use on bikes with rear shocks. Supports are rigid and are not meant for compression. NOTE: Due to the varying sizes of some bikes, the 50mm screw for the rear dropout eyelet may be too long for some models. If this is the case, please contact us and we will send a spacer. Spring retention system holds your cargo securely, and clip points on the bottom of the frame allow for panniers or straps/bungee cords to clip on.